For the past half decade, New York’s cupcake bubble has expanded beyond any sort of logical economic equilibrium. 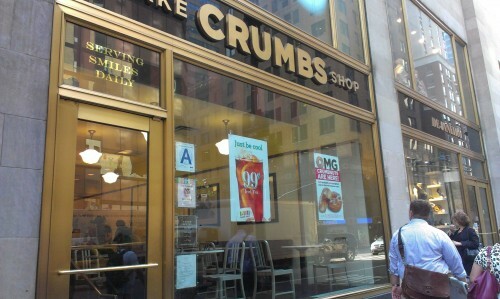 But the writing has been on the wall for quite some time, and it seems that Crumbs Bake Shop is the first major casualty. Like all crisis’s, there’s probably a lot of lessons to be learned – but thankfully there are many many other places to score a cupcake in Midtown. Posted by Chris H. at 8:30 am, July 8th, 2014 under Crumbs. They closed the one near my apartment a couple years ago, which I thought was odd given their IPO. Not that I was their target market. I am shocked to hear this bad news. I had always wanted to try their giant cupcake, now never will. They also had excellent frosted black and whites. Does anyone know another bakery in Manhattan that makes a giant cupcake? I was saddened as well. I liked the one around the corner from my office. I never did get to try the giant (25 dollar or so) one either…. was hoping magnolia would be the first to go. They’re not going anywhere. That place is constantly busy and has a smaller footprint. Sad day, love their cupcakes. The giant one isn’t as good in my opinion due to the uneven ratio of too little icing to too much cake. Not surprised. I predicted this years ago and expect some of the other cupcake places to follow. You can’t sell enough of those things to pay the rent on the storefronts. I feel terrible for the employees. BTW, a “going concern” is actually defined as a healthy business; contrary to what the words in the term suggest. So in reality, Crumbs is actually NO LONGER a going concern.